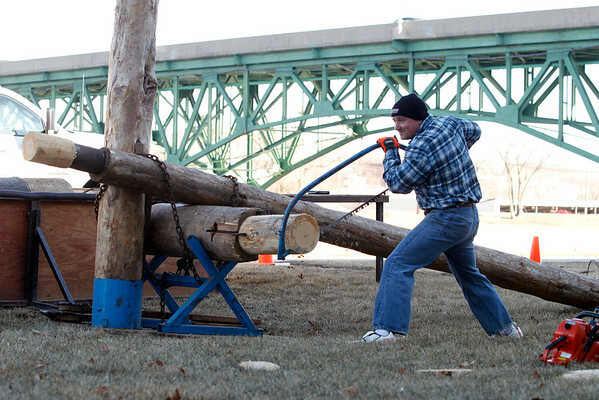 Jamie Fischer and Tanner Teasdale compete in the Lumberjack Enterprises demonstration outside the Bridge View Center Friday afternoon, Jan. 29. School teacher Abbey Korba narrates the Lumberjack Enterprises demonstration outside the Bridge View Center Friday afternoon, Jan. 29. Jamie Fischer and Tanner Teasdale compete in the competition. Fischer has been log rolling for 32 years and is part of a long line of professional log rollers dating back to the very first competition his grandfather participated in during the 1930's.